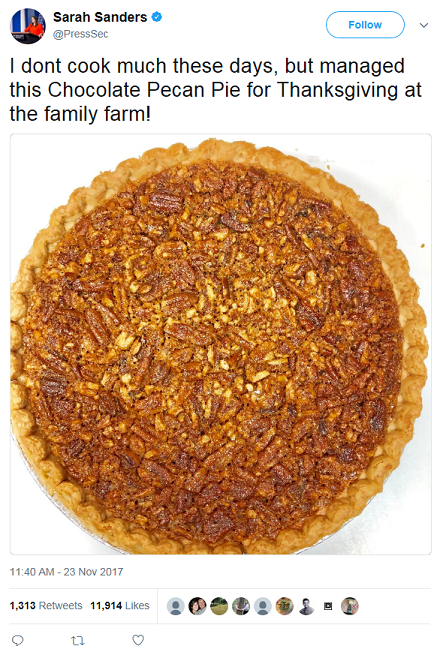 Apparently, the White House Press Secretary tweeted a picture of a chocolate pecan pie over the Thanksgiving Holiday. She claims that she made the pie and took a picture of it. People are claiming that this is a stock photo - apparently due to the white background and perfect looking pie. I haven't seen any actual claims that show the original pie photo that is the same as the one in the tweet. Is the pie picture an original picture as the White House Press Secretary claims or is this picture a copy that she found on the internet? I've tried googling and reverse image searches but I only get the original tweet, re-tweets and stories about the tweet. It may be a stock photo that isn't available on the internet. 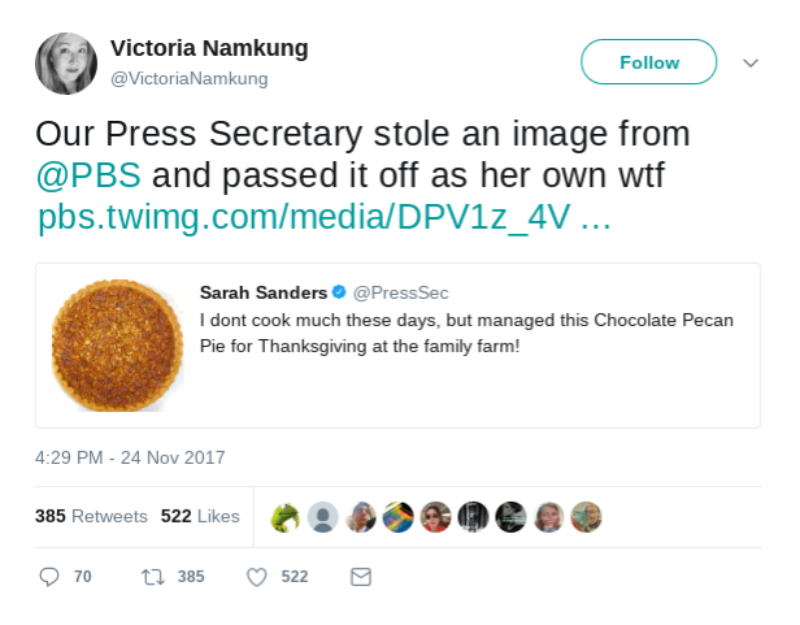 The amateur sleuths of Twitter thought that they had uncovered a Thanksgiving conspiracy today, claiming that White House Press Secretary Sarah Huckabee Sanders stole a photo of a pie from PBS and posted it as her own. But the thing is, pbs.twimg.com is just a subdomain that Twitter uses to host photos. It has absolutely nothing to do with the Public Broadcasting Service. Gizmodo also claims that reverse image search reveals that the image is an original. I double-checked, and that appears to be the case. While this is not definitive evidence in itself that Mrs. Sanders made the pie herself, I think it rules out the theory that she used a stock image. As always, extraordinary claims require extraordinary evidence, and I don't see any evidence that she used a stock photo or that it wasn't she who made the pie. Not the answer you're looking for? Browse other questions tagged politics . Do Crisis Pregnancy Centers lie about the results of pregnancy tests?